The trompe l'oeil technique used here works better on a sunny day when the real sky matches the painted blue sky on the building. On the day we visited this spot in the 10th arrondisment, the grey clouds visited the neighborhood too. 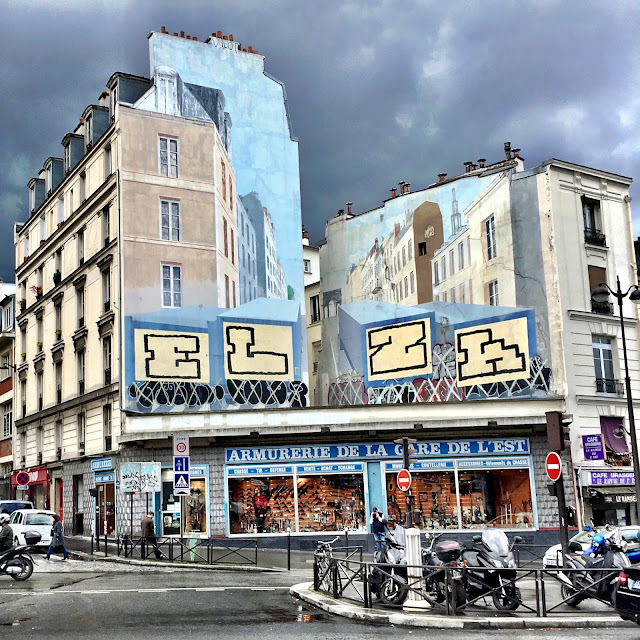 We spotted this one on the Rue du la Faubourg above a storefront near the Gare de l’est. But that’s all I know about it and so far, even my friend Google, has been of little help. I have no idea what he initials ELZA stand for, they don’t seem to be connected with the shop below, one that sells military accoutrements. 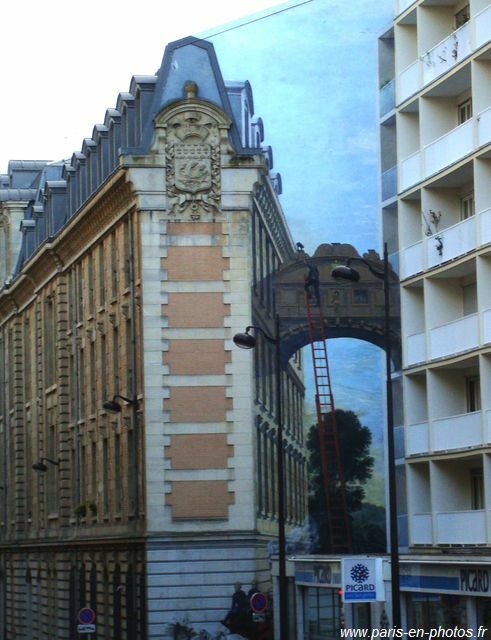 I did discover that Paris boasts an abundance of buildings done up in trompe l’oeil to fool the eye. The one above (not my photo) is of a wall next to a fire station. In the 20th arrondisement it depicts firemen saving a cat from what appears to be the Bridge of Sighs in Venice. To me, hunting for more examples of trompe l’oeil that I can share on Instagram sounds like perfect excuse to plan another trip to Paris ... as if we needed one! As usual around this time of the week, I’m hooking up with Paulita Kincer’s weekly Dreaming of France meme.